U.S. fisheries officials are raising the alarm about fatalities among another whale species after 28 confirmed minke whale deaths along the East coast in the past year, more than double the annual average. The National Oceanic and Atmospheric Administration has declared the deaths an "unusual mortality event" and launched an investigation, covering Maine to Florida. It is the first time the U.S. agency has simultaneously investigated the deaths of three different large whale species in the same geographic area, NOAA Fisheries officials confirmed during a teleconference on Wednesday. 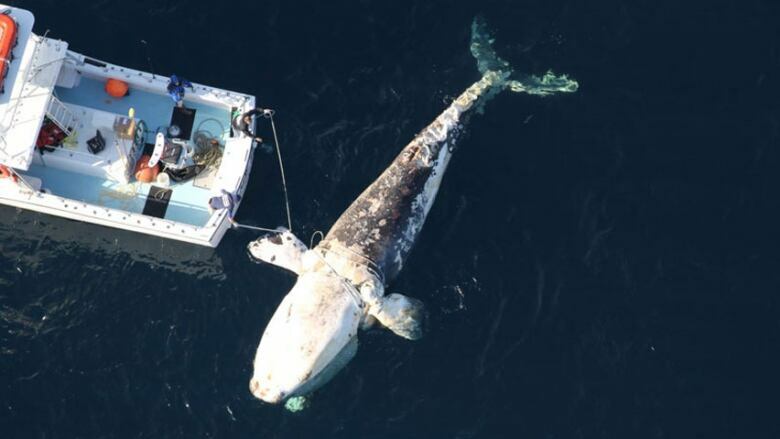 Investigations into an alarming number of deaths of North Atlantic right whales and humpback whales are ongoing in a bid to determine the causes and identify ways to prevent future deaths, they said. Another dead whale — this time a minke — washes up on P.E.I. One issue being explored is whether "environmental changes" might be leading the whales into fishing or shipping areas, said Teri Rowles, marine mammal health and stranding program co-ordinator. "Often when you have human interactions as a contributing or causal factor for mortalities or serious injury, it takes the whales being in the right place — or wrong place," she said. So "it's looking at where [the whales] are over time, what the drivers might be ecologically and environmentally for them to be there and then doing whatever management and mitigation measures we have to do with the information we obtain from that." At least 11 of the minke deaths have been attributed to human interactions, said Rowles. Nine involved fishing gear entanglements and two showed signs of blunt force trauma, often associated with ship collisions. Eight of the whales had suspected or confirmed infectious disease. The results of five other cases are pending, while the remaining five were not examined or documented, said Rowles. Minke whales are not considered endangered or threatened, but they are protected under the Marine Mammal Protection Act. "The number of mortalities that we've observed thus far are not considered a threat to the population sustainability," said Rowles. There are an estimated 1,400 to 2,500 minke whales in U.S. waters, based on a 2011 shipboard and aerial survey along the Atlantic coast. On average, about 12 minkes die each year. At least 18 endangered North Atlantic right whales have been found dead in the past year — 12 in Canadian waters and six in U.S. waters. There are only an estimated 450 North Atlantic right whales left in the world and only about 100 of those are reproducing females. Examinations of 12 of the dead North Atlantic right whales found five had confirmed or suspected blunt force trauma and five had suspect or confirmed entanglements, while the causes of death for the other two were undetermined, said Deborah Fauquier, a veterinarian with NOAA's office of protected resources. A total of 62 humpback whale deaths have been documented by NOAA since January 2016, including three this month. The most recent was on Jan. 27 in Florida, said Fauquier. Only 30 of the humpbacks have been necropsied. Of the 16 results completed to date, 13 had confirmed or suspected blunt force trauma, two died from entanglements and one from infectious disease, she said. "We ​will continue to investigate all three of these [unusual mortality events] and the investigation analysis part of it will be separate," said Rowles. "At some point in the future if there's a common cause or contributing causes that overlap, then we will merge those." NOAA is communicating monthly, if not weekly with Canadian officials, including Fisheries and Oceans and whale rescue teams, said Fauquier. 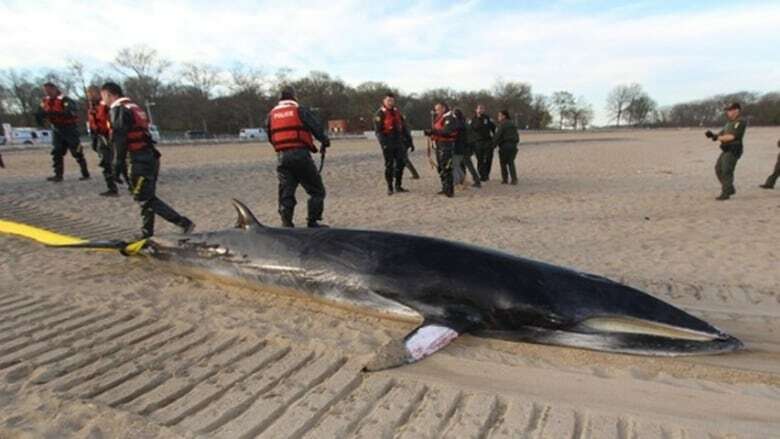 "They have not seen any elevation in strandings of minke whales in their waters," she said. "If things change, we can always consider adding Canadian minke whales to this investigation, just like we did for the North Atlantic right whales." Fisheries and Oceans officials could not immediately provide any statistics or comments. NOAA has responded to a total of 29 stranded minke whales since January 2017. Of those, only one survived. Nineteen of the minkes were already dead when crews arrived. Of the 10 remaining, one was successfully released and tagged, allowing officials to track the whale through migration, up and down the coast of the Atlantic, said Rowles. Three were euthanized and the other six died on their own, she said. About seven per cent of the whales were calves, 46 per cent were sub-adults and 18 per cent were adults, based on their sizes, said Rowles. The ages of the others are unknown because the whales were not intact and officials couldn't get accurate measurements, she said. A minke's normal lifespan is up to 50 years. The majority of the strandings occurred in the New England area, from Maine to New York. Massachusetts had the highest number, with eight, followed by New York with seven and Maine with six. New York also saw the highest increase over historical averages of any coastal state. The most southern stranding was in South Carolina. Complete or partial necropsies were performed on 18 of the minkes, six were documented only through photographs and measurements and five were not recovered. Minke whales are "the most abundant" of the great whales and are found throughout the world in polar, temperate, and tropical waters, including the North Atlantic, according to NOAA officials. The mammal's size, coloration and baleen varies, depending on their geographic location, but they can weigh up to 20,000 pounds and reach lengths of up to 35 feet. Mariners who encounter any dead or distressed minkes at sea are urged to notify the Coast Guard immediately so officials and either retrieve the carcass and investigate the cause of death, or provide assistance. Anyone who finds a beached whale is also encouraged to contact authorities.